Ever heard of an Audax? 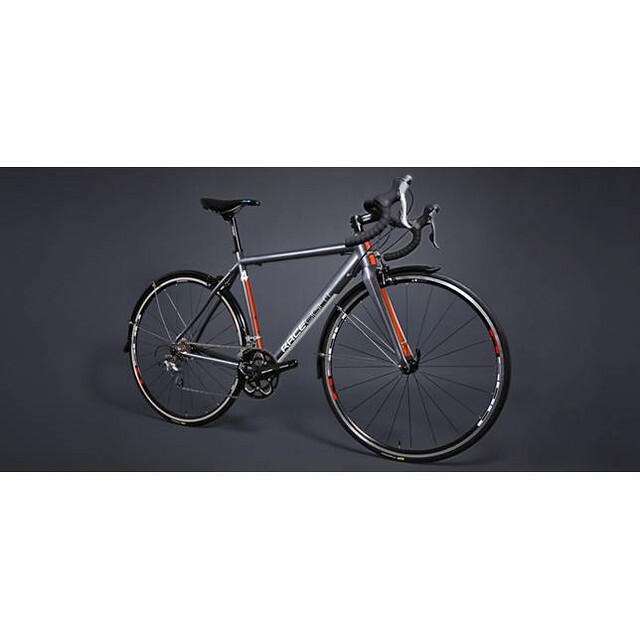 A Sportive or Audax bike is a bicycle that allows for mudguards and in most cases a rear rack it is lighter than a touring bike and the geometry is more racey (yet slightly more relaxed than a road racer). 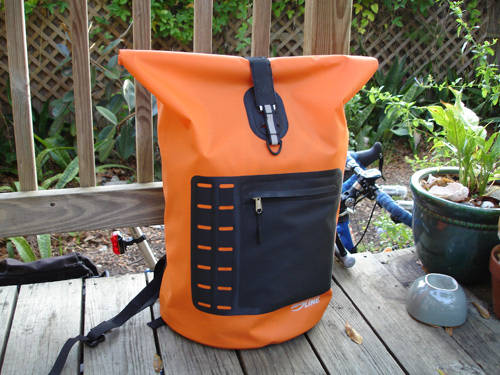 A Touring bike is a frame designed to handle bicycle touring, with mudguards and front and rear pannier racks (not all come with front racks as this is dependent on the fork). Special features of a touring bike may include a long wheelbase (for ride comfort and to avoid pedal-to-luggage conflicts), frame materials that favor flexibility over rigidity (for ride comfort), heavy duty wheels (for load capacity), and multiple mounting points (for luggage racks, fenders, and bottle cages). Oh yeah, did you notice the other word in there? “SPORTIVE.” In the US market, or at least in a few bike shops that I’ve been to, they have dubbed what our UK friends call a Sportive as a “fitness bike.” Basically it’s a bike that isn’t quite a sporty road bike, not as burly as a touring bike, but a bike you could use to commute with or take for a 15-20 mile bike rides and still be comfortable. Not bad right? I’m almost positive that the US Market will start to use those terms in the near future to introduce new commuter bikes to make them sound fancier. Taking a vacation abroad is not always cheap although there are ways to cut the cost and make it more affordable. Package holidays to Spain are just excellent travel options for holidaymakers who want to enjoy a grandiose vacation at discounted rates. Renting a bike or arranging a cycling tour is also an option for budget conscious travelers and there are plenty of benefits to doing this. There are some majestic landscapes around Spain and the slower pace of bicycle riding provides the opportunity to enjoy these to the fullest. It is still fast enough to easily get between destinations, with the added advantage that stopping off at points of interest is simple to do. A day can be started by checking a route to see where the attractions are although the pace of travel makes it possible to see and stop off at others along the way. Traveling under your own power is an environmentally friendly option when it comes to getting around on a vacation. This makes cycling an ideal choice for anyone with green credentials. They can take in the sights without having to use fuel-consuming transportation and this is obviously good for the environment. There are also benefits for the rider, with the fresh air and exercise being good for them. 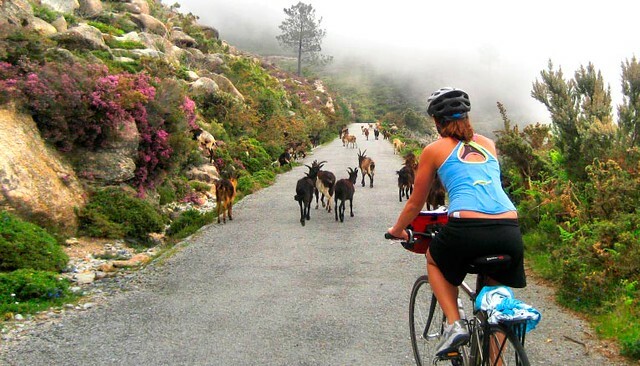 Cycling holidays come in all shapes and sizes in Spain. Serious bikers have the option of following some of the routes of the Vuelta a España professional road cycling race, while others can take advantage of one of the many leisure and family cycling tours that are on offer. It is also possible to simply rent a bike as a way of commuting on a vacation. 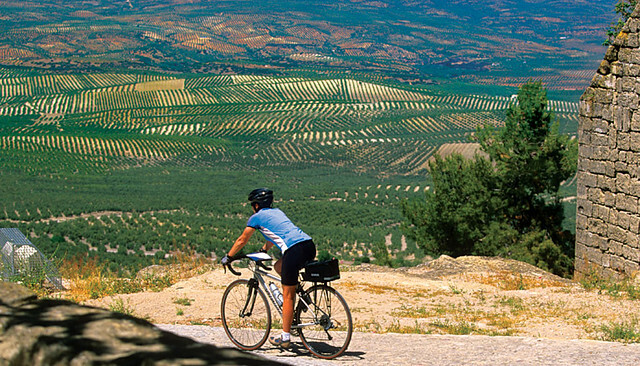 The warm, dry Spanish climate makes traveling by bicycle a pleasant experience and it is an enjoyable and affordable way to see the sights. As shown above, there are plenty of benefits to this mode of transport and it is something that anyone can do. So rent a bike on a trip to Spain and have a vacation that will leave you wanting more. Las Vegas, Nevada, is one of those cities that everyone has an opinion about, even people who’ve never actually been there. If you think it’s just smoky poker rooms, mind-bendingly noisy slots and cheesy entertainment, you should know that – as well as all that – there’s pretty much everything anyone could possibly want on offer here. There are good cycle routes around the city itself, as well as trips out of town. There are a couple of things to be aware of if you’re planning a trip, however. Firstly, check the temperatures for the time of year you want to go. There’s a reason all the casinos are air-conditioned, and from May to October, average highs tend to be between the high 80’s and the low 100’s – not most peoples’ idea of perfect cycling weather. Spring is ideal. Secondly, unless you’re fanatically anti-gambling (in which case, why are you going to Vegas?!) you’ll probably end up in one of those casinos at some point. Some of the best riding in the area is to be found on the edges of the city, with wonderful desert roads winding past the other-wordly rock formations and mountains, but there’s also good news for town riders; 100 miles of dedicated bike routes in Las Vegas itself. 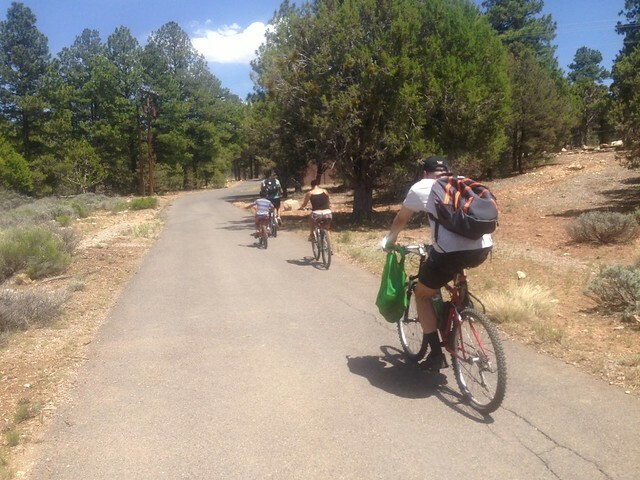 One of the best routes out of town is the Red Rock Scenic Ride, a 13 mile loop taking in some astonishing scenery. Mountain bike types will love the Cottonwood 11 mile route, while there’s a 35 mile paved track around Lake Mead that’s a must for the energetic cyclist. North Las Vegas is a good spot for city riders who want to get the feel of the place before belting up and down the Strip. There are miles of cycle routes (wide outside lanes and signs instructing drivers to “share the road”); cycle lanes (signed/striped sections of the road for cyclists only) and shared-use paths (separate from vehicles, also used by pedestrians and skaters etc). Routes around North Las Vegas Airport are highly popular as a result, and many local riders post details on bikinglasvegas.com; one example is the Training 25 route added by member Cabinetguy433, starting in Myrtle Creek Court and circumnavigating the airport for just over 25 miles. This route has the advantage of taking you to Downtown Vegas and Fremont Street on the way, a whole different experience form the mega-casinos of the Strip, and a window into what Vegas was like in days gone by. You might want to stop here and practice your new-found gaming skills! 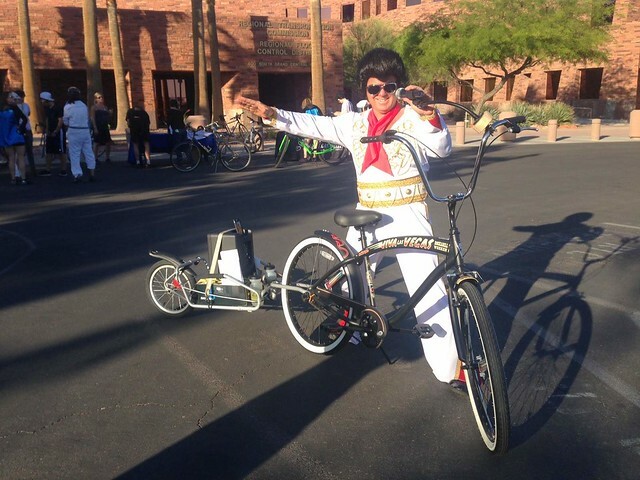 Finally, when you’re planning your Vegas bike trip, don’t forget that September brings Interbike 2014, held again this year at the Mandalay Bay Hotel. 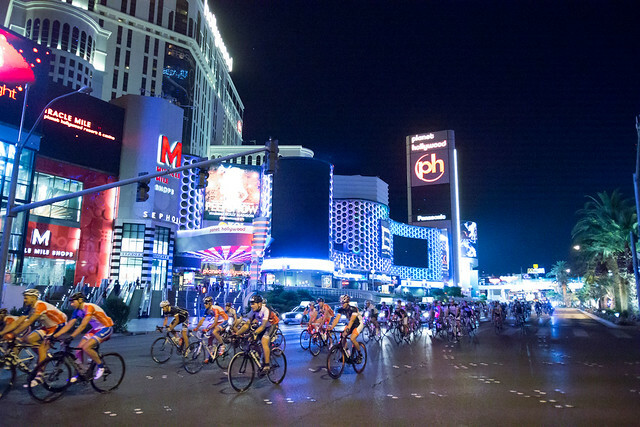 For the first time, the public is invited to attend Interbike on the final day of the show. Registration is open now. Although summer is well on its way, which means sunny (and sweaty!) rides, there are many places where the hottest season can be unpredictable. England for example, is well known for its constant weather variability. The typical ‘British Summer’ is characterized by unexpected showers and bursts of hot sunshine where everyone cuts back on clothing all of a sudden. If you’re one of the unfortunate ones, and this sounds like the summer time where you are, here are some important tips for cycling during an unpredictable season. You might associate layering with colder, winter weather but layers can also work wonders in warmer weather too. It’s worth investing in a comfortable and high-quality base layer that is both breathable and insulating, as the cutting-edge material technology that is on the market nowadays can work with your body to naturally adapt to different weather conditions. With a base layer you can also add or remove other layers on top according to your comfort level and temperature. In the summer months, you’ll probably want to keep to cropped cycling pants or shorts and t-shirts or more sleeveless tops. These are great in hot weather but when it starts spitting or getting windy all of a sudden, you need to be able to adapt. Keep some leg and arm warmers to hand to stop off and slip on just in case it gets chilly or you need some extra coverage. For any outdoor activity or exercise, it’s imperative to have a lightweight, manageable and comfortable waterproof jacket that you love. 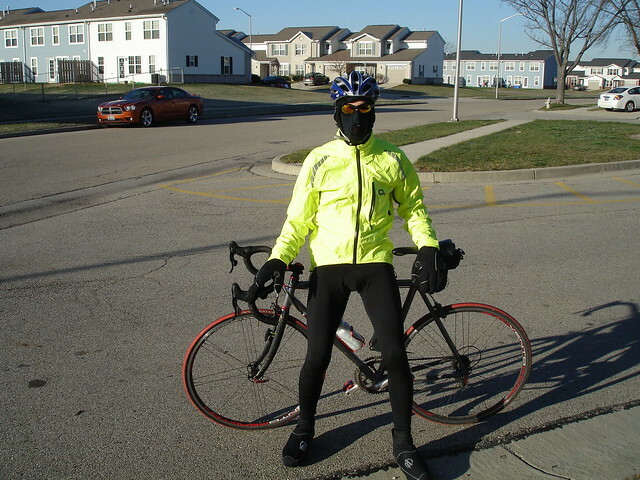 Especially when riding to and from work, you need to keep protected just in case the clouds start rolling in. Look for the right material and be sure that is has tight, taped seams to stop water getting in. Mesh lining is an important feature as it allows sweat to escape but look out for too much mesh, as this can make the jacket bulky. One of the best features of waterproof cycling jackets is the dropped tail that covers your lower back and derriere from those dastardly mud splashes, so be sure to look out for that too! Don’t let your important documents, clothes and snacks get soggy on the way to work! To protect you from the wind, mud and rain, be sure to grab yourself a good waterproof bag cover that fits securely over your rucksack. There are plenty of different covers on the market and you can even buy a separate waterproof bag for all of your belongings to save fiddling with the bag cover. Preparation is key if you don’t want to end up arriving at your destination looking like you’ve been dunked in the nearest pond. Make sure you have all the precautions in place and check-up on the weather conditions regularly for enjoyable cycling this summer.